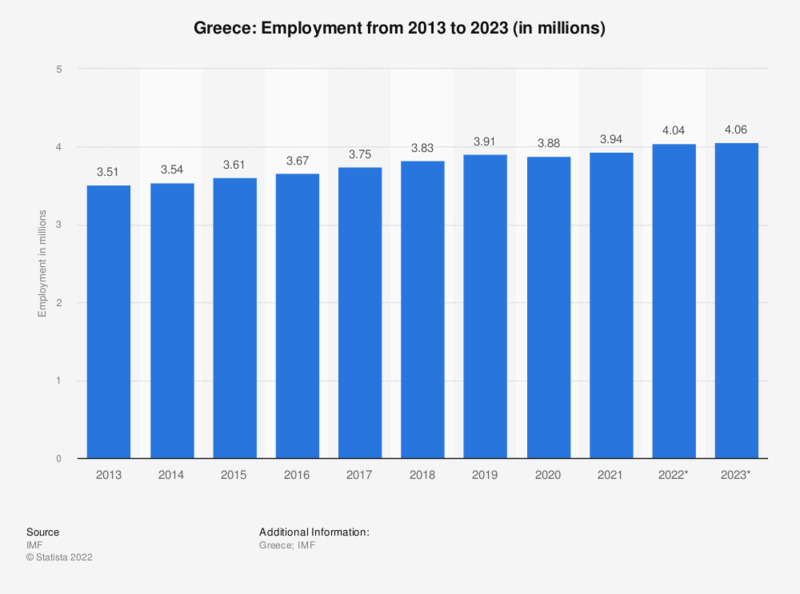 This statistic shows employment in Greece from 2009 to 2016, with projections up until 2019 .In 2017, around 3.75 million people were employed in Greece. Just like the rest of Greece’s economy, the job market has been adversely affected by the economic crisis of 2008; it has been struggling to recover ever since. The majority of the Greek population lives in urbanized areas, but lay-offs and job cuts affect the whole country; the unemployment rate in Greece has been increasing dramatically all over the country and has almost tripled since 2009. Greece’s economy relies heavily on services; most of Greece’s gross domestic product is produced in that sector. The gross domestic / GDP growth rate in Greece, however, has not improved since 2009 – on the contrary, after falling to an all-time low in 2011, GDP is now even lower than in the year recession hit the country. Some of the most important industries for Greece are the maritime and shipping industries, as well as tourism. The export of goods has been on the rise, while imports have been decreasing, causing the trade deficit to improve slowly but steadily. Still, Greece is not out of the red and probably won’t be for some time. National debt in relation to gross domestic product is growing, and Greece is still ranked second on a ranking of countries with the highest public debt worldwide. Austerity measures and rescue packages from the European Union are now put in place to ensure Greece’s recovery from the crisis. Figures have been rounded to provide a better understanding of the statistic. Everything On "Greece" in One Document: Edited and Divided into Handy Chapters. Including Detailed References. Which attributes do you associate with products made in Greece?